For the last three centuries the Naval Infantry was the sole force in Russia trained to conduct forced landings to seashores. In 2017 the Russian military reforms reached a point that more amphibious landing capable forces were needed. In a surprising moment of military insight, they begun training the VDV airborne forces to conduct amphibious landings on their own. The 2017 test runs were followed up with joint exercises between the Naval Infantry and the VDV. The VDV brings some unique capabilities to the table, as it’s a service that is specialized in expeditionary operations. The combined air and naval landings also allow the Russian armed forces to move in significantly more men and machines that either of the branches could ferry on their own. In the beginning of the February 2019 the Russian marines based in the occupied Ukrainian territory of Crimea conducted a routine landing drill to an unprepared beachhead. The Russian armed forces TV-channel provided an interesting insight into this exercise. The combined arms operation included Mi-8 helicopters landing VDV scout squads to secure the beachhead. The Ka-52 attack helicopters and armed Mi-8 variants also provided over-watch for the operation. 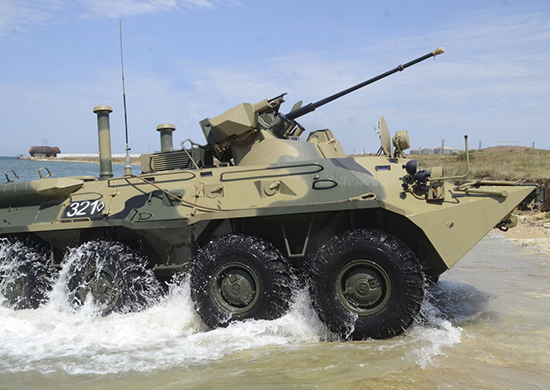 The initial landing force swam to shore from the Alligator- and Ropucha-class landing ships with the Naval Infantry BTR-82A infantry fighting vehicles. These spearhead platoons then moved further inland as the landing ships and smaller landing crafts begun to unload the rest of the naval infantry battalion and the supporting VDV formation. It’s also noteworthy that the landing force included organic self-propelled artillery in the form of 2S1 howitzer battery, that had landed before all of the infantry companies had reached the shore. This combined with the mortar units of the VDV allow a beachhead to support its push inland even without air support. Even as the beachhead was still forming, the BAT-2 tracklayers were building a ramp from the beach to the higher ground to allow the flow of supply from the ships to the troops fighting inland. An interesting part of the footage was also a Grisha-class corvette that provided close cover for the landing force with its 76 mm AK-176 and 30 mm AK-630 guns. The naval assets focused on defending the force from hostile UAVs trying to interfere with the landing. While the video doesn’t clearly show the presence of main battle tanks, other sources revealed that the training operation was supported by the T-72B1 and T-72B3 tanks of the Crimean Naval Infantry. Is this a game changing capability? Probably not. It does however tell that Russia still puts a high priority to amphibious operations, that are too large for the naval infantry alone. At the same time, the parachute battalions attached to the Naval Infantry brigades ae training to support VDV airborne landings if needed. There are viable targets for these types of operations from the Arctic islands, through the Baltic Sea all the way to the Ukrainian coastline. Defesa - Agência de Notícias é o melhor site sobre defesa do Brasil.